Why Would You Need To Secure Your Firearm In The Car? Gun free zones, legally imposed or otherwise, are common places where you may need to disarm before entering a building or property. Perhaps your employer doesn't allow firearms, you have to serve on a jury at the local courthouse, or you need to enter your kid's school to talk to a teacher. In each of these situations (local law depending) you will likely have to disarm and leave your firearm in the vehicle. In addition, as you likely are aware, despite any local laws Article 926A of FOPA grants you the right nationwide to transport a firearm through any state so long as it is properly secured and/or not readily accessible. (More information about 926A here) When you travel through a state that doesn't honor your permit you need to secure your firearm to be in compliance with 926A. I know gun owners who exit their vehicle, open the trunk of the car, and then disarm as discretely as possible into the trunk of the car. While secure, this is a bad practice. You are less likely to remember to rearm when you return to the car, and bystanders are more likely to discern or see your firearm. Why Not the Console or Glove Box? A few years ago I wrote an entire article solely focused on the reasons you should NEVER store your firearm in the glove box or console. The short version? 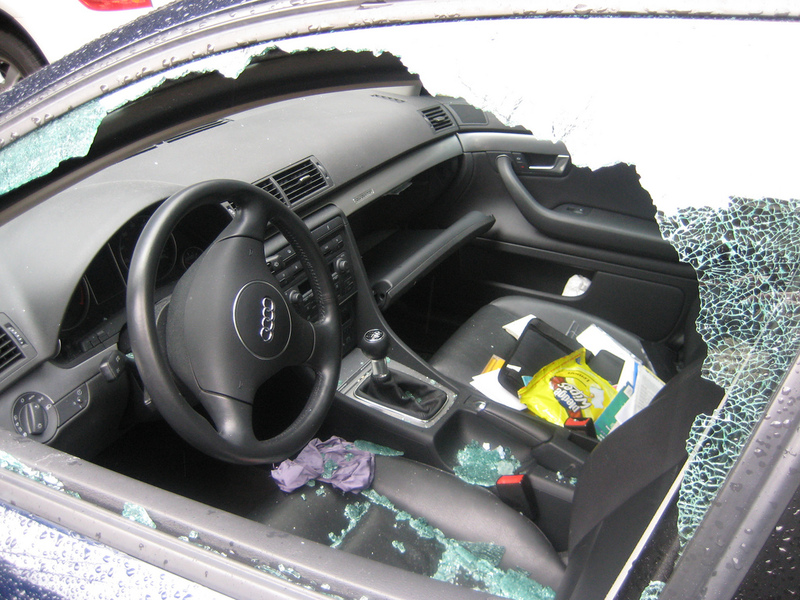 Criminals are most likely to look there first for valuables if they break into the car, even when locked the glove box is really easy to force open, and Article 926A specifically mentions the glove compartment and console as NOT qualifying as secure storage. You need something much better! What Are The Best Practices and Considerations? 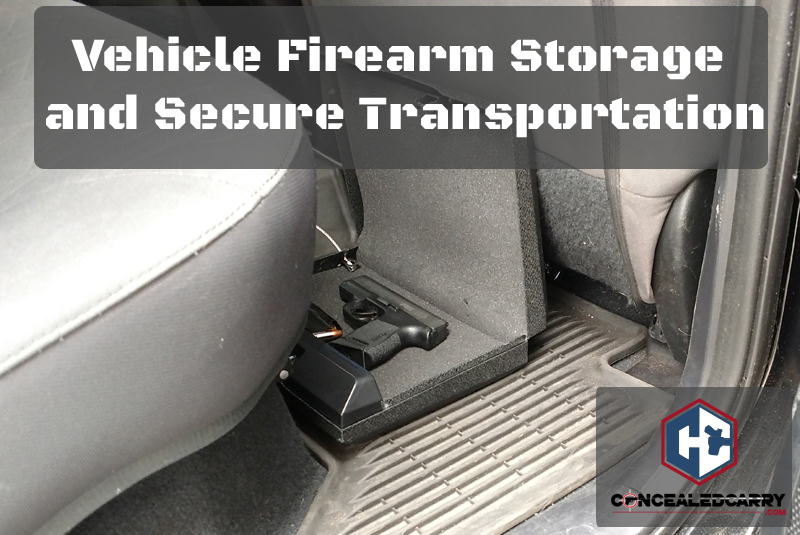 One of the greatest challenges of firearm security in the vehicle is the issue of securing the safe to the vehicle. The safe doesn't do you much good if any intruder to the vehicle can simply grab the safe and haul it off to be forced open later with the right tools. The easiest way to solve this problem is with a security cable as shown in the above picture. A lot of smaller gun safes have a small hole on the side specifically designed for being tethered to a simple security cable. 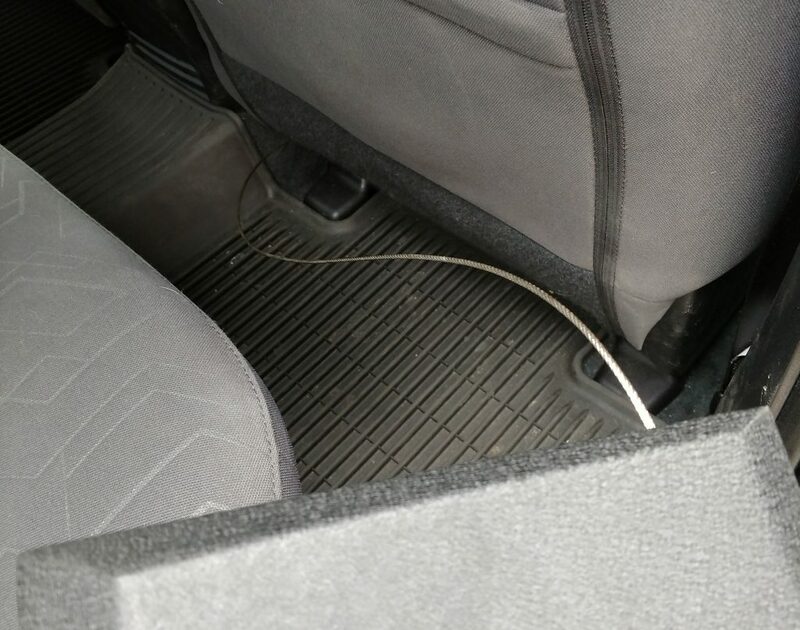 You can secure it to the frame of the vehicle in some places but I've found most vehicles have a place in the seat where you can wrap the cable around. Seats are often extremely difficult or even impossible to remove without specialized tools and knowledge so they make for great anchors for your safe's cable. Whatever you do to secure your safe, be sure it is effective and practical. For daily use, you ideally want your secure firearm to be easily accessible. 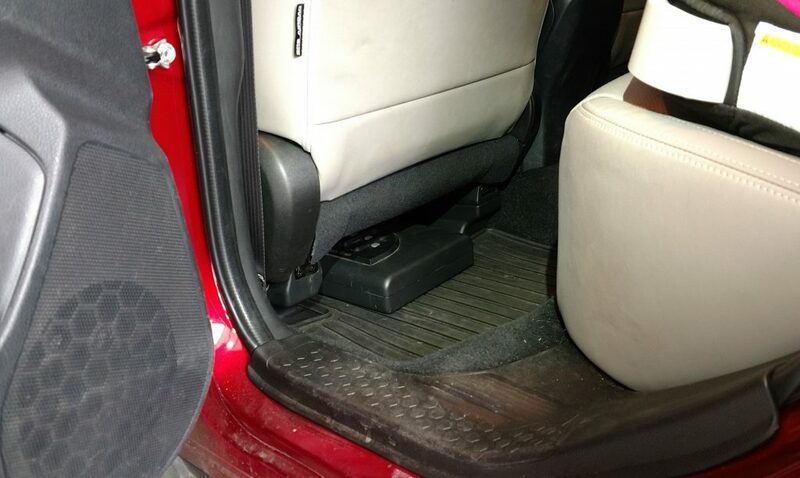 Putting the safe in the trunk or anywhere you cannot reach from the driver's seat is going to create some challenges. First, you won't be able to secure and retrieve the firearm as discretely. Second, when you first return to your vehicle there will be a greater delay in the time before you are armed once again. Ideally, you don't want to use a firearm safe that is kept in the vehicle such that any passerby who even glances into the vehicle will notice the safe there. This will act as a temptation to criminals and identify you as a gun owner to anyone who takes a ride in your car. Look for places (and safes) that can be discretely stored out of sight. I have found one of the best solutions is to put the safe under a seat. Most “Clamshell” style safes fit the bill and my favorites are the Sports Afield RV1 Lightning Safe and the Gun Vault MicroVault. They both will get the job done and they both have some advantages over the other. I recently did a head to head comparison video where I compared them. Ok, I'm ready to hear your comments. For those of you who already have a good setup in the car please share with us in the comments below what you are doing and what safe you are using that works best for you. I also have a clam shell safe in my vehicle. It is tethered to the frame of the front passenger seat, and the safe is discreetly dropped into the seatback pocket. The safe is not visible (other than a small portion of the tethered cable), and easily accessible to me from the driver’s seat. I have a 14 King Ranch F3500, I prefer to use my standard handgun safe, which locks after weapon is put inside. Additionally, my weapons safe fits in a lockable area, divided into two sections under the rear seats, both areas are lockable, and in two separate containers of their own, which is lockable after seats are put back in down positions. And these safes are NEVER viewable outside the vehiicle !! Exceedingly SAFE !! Have you considered Gun Vault which installs in the console of larger cars/trucks and locks? This is more secure than a little vault that connects by a (cutable) cable. The site you recommend doesn’t help me out. I have a 04 Dodge Dakota. Any help? Hmmm. I checked several different manufacturers and I see a lot of stuff for Ram and Durango but NOTHING for Dakotas. There are some generic options you can find but nothing really built for a Dakota of any year. This is a very comprehensive writing. Thanks. My son living near Las Vegas recently experienced being the victim of an ‘vehicle burglary’. And yes, his Glock 9mm is now owned by a criminal. Beyond the pathetic gut wrenching agony of “being violated” by the truck break-in, he also has the crappy load to bare knowing his gun could be used to harm someone. It’s impossible for me, as Dad, to criticize him as I had my S&W 9mm stolen from me in Phoenix years ago. I also got 13 staples to close the head wound from being struck by my own gun. You can lecture all you want, but people are just not willing to take personal responsibility for their weapon’s security UNTIL they find out it CAN happen to THEM. My prayer would be that folks who still have their ‘virginity’ from crime victimization take the proactive actions written into this fine advice. You DON’t HAVE TO BE one of us that DID learn the HARD WAY. As to it being easier, I’m not sure. If you always know exactly where you are going to be and know in advance if you can have a firearm there then I suppose it might be easier. I’m inclined to say you may sometimes end up at a gun-free zone without having previously planned it. Further, if you are doing a trip across state lines then leaving it home means being without a firearm for days or even weeks depending on the length of the trip. For me, and for many CCWers, I think we prefer to have the firearm as often as possible and so having a secure place/method to secure the firearm in the vehicle is a necessity. Can you give me the name of the website or other source that you are using? I too would like to know when and where I might be assaulted. Sometimes i have to go to the post office or chiropractor in the middle of my day. Leaving my firearm home for the whole day because of just one stop leaves me unarmed too long. You never if, or when you’re going to need it. States that don’t “honor” other States’ permission slip CCW …translated means > they don’t Honor our 2nd A. and THAT part of our National Constitutional Freedom…….And, shouldn’t THAT lack of 2nd A. recognition be illegal? I have been looking for a pistol vault for securing in a car. Everyone I find is electronic, battery operated. Are there any options that are mechanical and don’t rely on electronics and batteries? Andie: I have several of these Gunvault units. Key-only. No flimsy combo lock or battery. Works great for flying. You are only one with access. Inexpensive compared to other options also. Can search for it – available at several places. Wish it was here at CC but can only carry so many options. I use a.50 inch thick bicycle cable, wrapped around the seat anchor and then attached to the gun safe. Heaven forbid if I lose the key. I have a simple tethered clam shell type in every vehicle, BUT be aware of your local and state laws concerning transportation of a firearm. In many states you CAN NOT place a loaded firearm, even in a safe, to transport. It may have to be unloaded. Although some states allow ammunition in the safe with the firearm. So don’t just pull your CCW out of your belt and place it in the vault and think your to good. Everyone who carries needs a up to date carry travel guide and obey each states laws. Know your laws and transport correctly. I use a console vault in my Tacoma from Console Vault. It was made to drop in to the console with no modification. No I would not say it is as fast as the push button but those safes would not be as easily accessible as the console safe. It has a four dials. I keep them where I can easily hit my four numbers by one digit each in a mix of up or down. I do have a four button safe next to my bed for easy access at night. The console vault is good for many things of value.